Watching the Star Wars marketing machine take hold of young minds ahead of the much-awaited Episode VII release this week is both fascinating and frightening - the power of Disney's Force should not be underestimated. 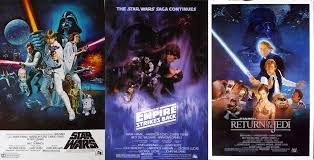 I remember myself bouncing of the walls with excitement about Return of the Jedi despite not having even seen Star Wars or The Empire Strikes Back, to the extent that I watched it first, thus spoiling for myself one of cinema's most celebrated twists. 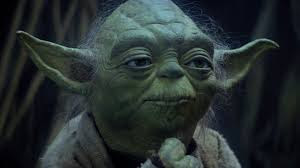 I could not stand idly by and let the same fate befall the offspring - time to don the Yoda ears and educate the young padawans on the original trilogy. "Much to learn you still have....."
Of course, the films now occupy such an exalted status as a cultural touchstone that they are virtually review-proof. A New Hope is still great fun and although there is certainly a touch of amateurishness to some elements of the writing and direction, those special effects and no small amount of charm, make it a winner. Empire obviously remains the best of the trilogy; a more sophisticated, better-balanced, better paced, better-acted film and genuinely gripping as events unfold. Finally, Jedi provides a thoroughly satisfying conclusion, the Ewoks are less irritating than I remembered and that 3-way climax is really rather excellent. And of course, throughout all 3 episodes, that John Williams music thrills like few other scores can. Indeed, if any one element of the films seemed to entrance the offspring, that was it - let's hope Lucas cut Williams in on at least some of those merchandising rights. But what about the rest of the film, my young apprentices? I have taught you well, have I not? The Kids are All Right? No.1 (9yo): "Meh, not as good as Lord of the Rings"
No.2 (6yo): "Where are all the Angry Birds?" No.3 (2yo): Left after 1 minute, dragging Peppa Pig toy. Unavailable for comment. And now, a disturbance in the Force. I have tried and failed to hide the truth from them, but they see much and are now aware of the existence of the prequel trilogy. And they have demanded to see it. What if they like them more than the originals? What if they want to watch them over and over? What if.....*drops voice to horrified whisper*.....they like Jar Jar Binks? A full list of films in Kids Corner can be found here.